Berlin’s tree map is part of a comprehensive online data mapping service that is good for professionals but too complex for the general population. It is one of 300 data maps that can be layered on top of one another and display everything from soils, vegetation and pollution to social, economic and demographic data on residents, to historical maps and aerial photos. 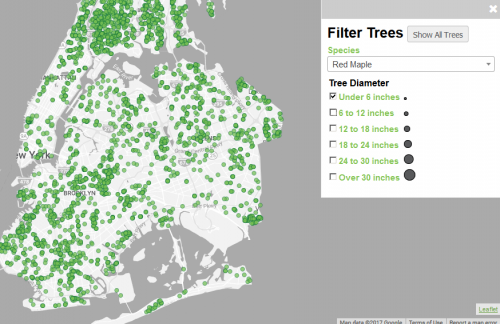 For New York you would have to download the raw data from various city data portals and use your own mapping software. 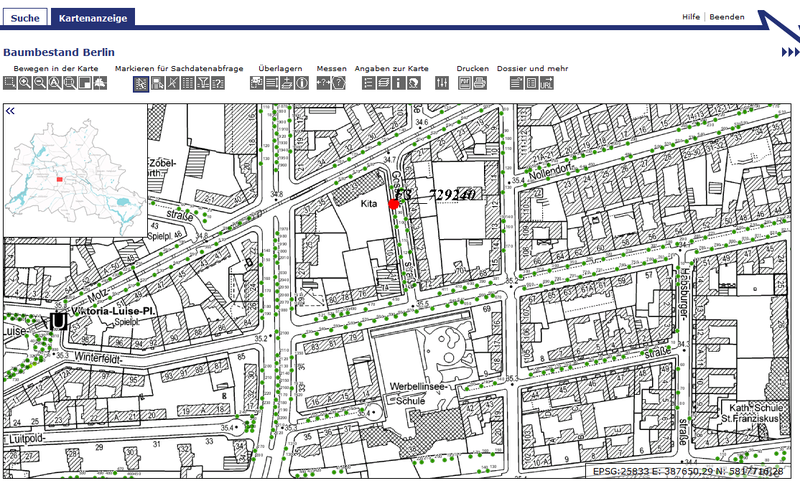 However, most people who have any use for this data will have that already, so it’s not much of a drawback. 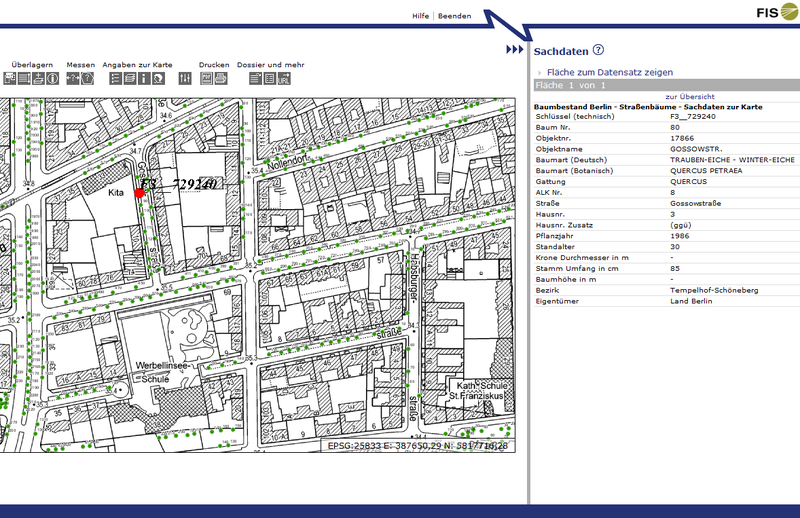 Also, Berlin’s online maps run slowly enough that it’s hard to imagine anyone using it for a whole project, meaning the pro user will have to download the raw data anyway. 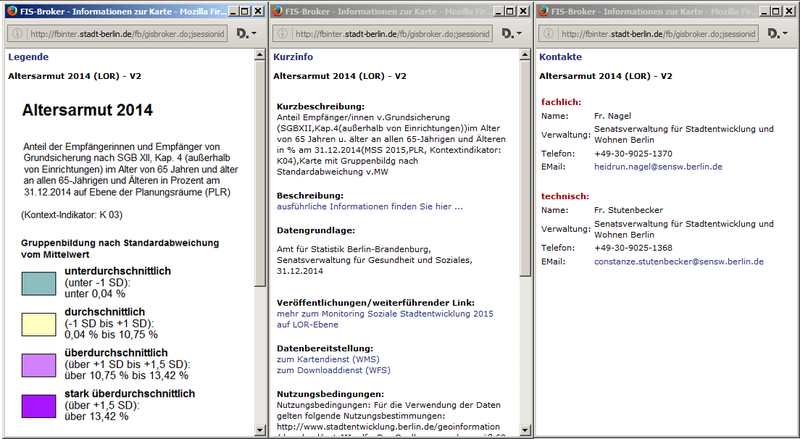 A big plus, though, is that Berlin’s data sets include name, email and phone number of the respective contact people – not just a webmaster – which is a stunning achievement in a notoriously un-transparent city bureaucracy. 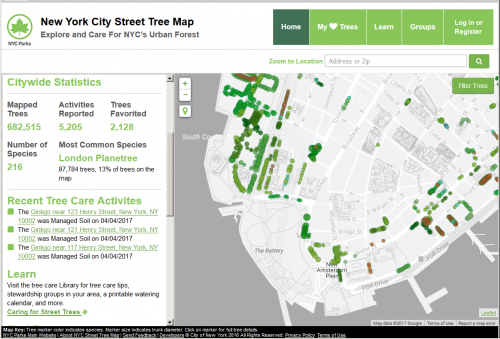 Berlin, critically, includes one piece of information that is essential for urban forest research, and which New York City lacks: the year of planting. 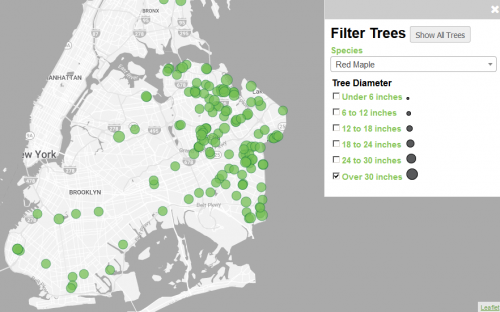 It’s hard to overstate what a gold mine this is for ecologists because otherwise ascertaining a tree’s age is prohibitively expensive and time-consuming on a large scale – so much so, that it’s not often seen in urban forestry research. 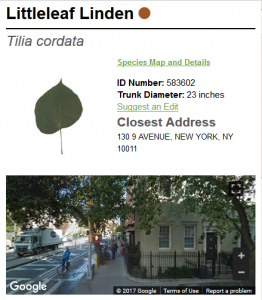 If Berlin’s data includes trunk diameter from prior surveys (I didn’t see it online) in addition to current diameters, this would be a data set of unparalleled worldwide significance for research on urban tree growth. A further limitation is that the tree map can’t display more than a couple blocks at a time and there’s no way to quickly move around to various parts of the city. I haven’t found a way to filter by species but given the tool’s complexity it could be buried in there somewhere. This is where New York City’s excels. The user-friendly interface allows you to instantly see every tree mapped at any scale from your own dwelling, to your neighborhood, borough, or entire city, including photos of every one of the 682,515 mapped trees, a handy description of the species, and an identifying photo of a leaf – and it runs quickly and flawlessly on both computers and smartphones. 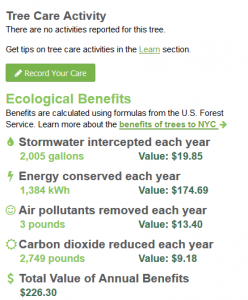 Dollar values are displayed for the value each tree provides per year for a host of environmental benefits such as stormwater retention and energy savings. Berlin’s map lacks these, and in fact the principle of measuring the monetary value of ecosystem services is just now appearing on the horizon in Germany whereas it is established in American ecosystem management. There’s a button for translating the entire site into any language and it really works. Further, anyone who tends a tree – the city promotes watering, pruning and other tree care by volunteers and provides free training – can log their actions for that specific tree. The drawback, however, is that much of the data was collected by volunteers, unlike in Berlin, in a colossal project called Trees Count! 2015. Whether this affects the data’s accuracy is unclear. The last survey, in 2005, also had large-scale volunteer participation and the data, not being accurate enough for critical quantitative purposes such as research and city management, primarily had value for seat-of-the-pants estimates. However, that was before smartphones existed for data collection and before the parks department had experience in successfully engaging thousands of volunteers to plant one million trees over ten years in its MillionTreesNYC project (which hit the one million mark in 2015, two years ahead of schedule) – so the accuracy could be significantly greater now. 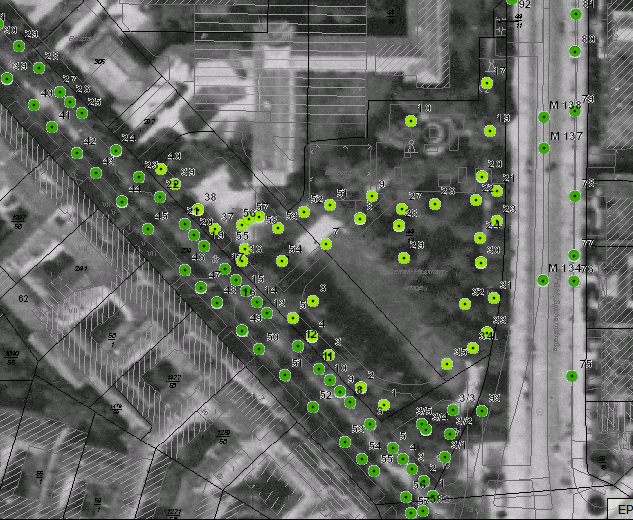 To sum up: it’s hard to imagine Berlin’s tree map improving the public’s awareness and connection to their street trees because it’s unlikely anyone using it isn’t already deeply engaged with them. New York’s map is well suited for this very purpose. Berlin’s tree age data, however, is extraordinary and the integration into a comprehensive online city data map, and the reliability of its professionally collected data are preferable for the specialist. Are you familiar with Los Angeles’ NavigateLA – a publicly available web based geospatial city and county data browser and repository? 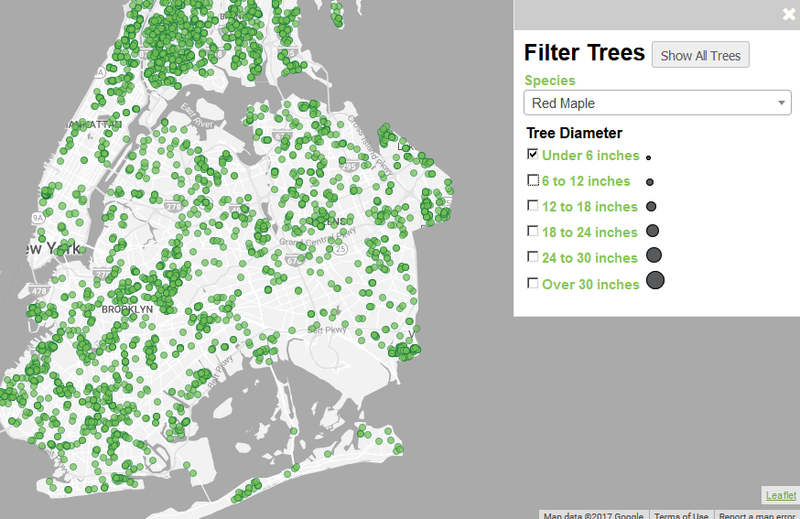 There are tree data in there. It’s not super obvious where / how to use this system, but it’s easier than having to use your own mapping software and download the data! Thanks John. This great, I hadn’t seen Los Angeles’ but I have seen a fair amount of other cities with similar outstanding use-friendly online data maps. Soon I will be posting about the next level of maps where they show the hundreds or thousands of stormwater absorption structures for absorbing rainwater into the ground before its pollution reaches sewers and streams, aka bioswales, raingardens, green infrastructure or sponge cities. Lots of US cities have this. Sadly I just went to a launch event with the Berlin Environmental Commissioner where they announced the city’s first steps in thinking about maybe someday trying this stuff out.